This skirt "accidentally" hopped into my cart a couple years ago from thredUP ($10 off your first order here). It was one of those miraculous finds that for under $10 and for real leather, I just needed to buy. It's definitely a classic, high quality piece and at the price point, it certainly hasn't taken long to get my cost per wear down quite low, but initially I was stumped on how and where to wear it. 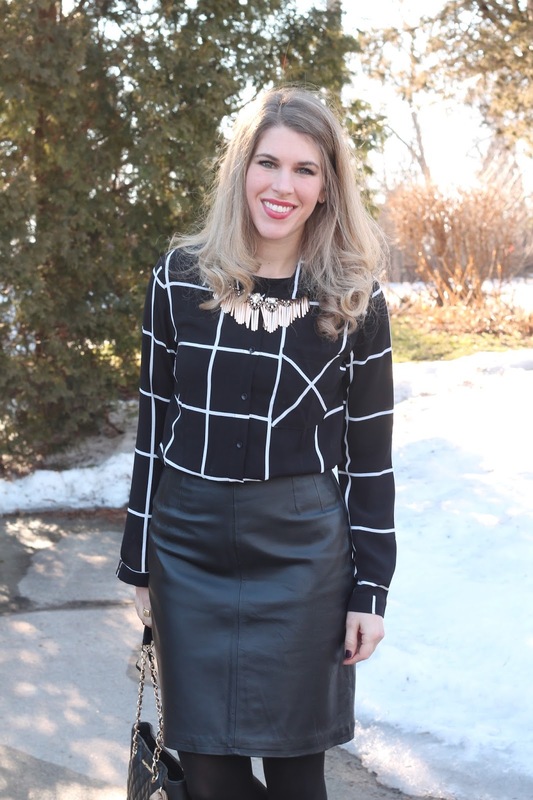 After some trial and error I came up with some tips on how you can easily incorporate a leather skirt into your workplace attire. 1. Keep it neutral. Leather can be bold. By pairing it with neutral colors like black grey, beige, or white, it helps to tone it down. By pairing my skirt with this new black and white button up from SheIn, it adds some interest, but is understated enough to keep the outfit from being too loud for work. 2. Use lightweight fabric. This is less of a workplace tip and more of a styling tip. Nevertheless, if you have an all leather piece, it works well with a lighter weight fabric. Leather is a heavy fabric and to avoid looking heavy all over, pair it with thinner pieces. This top is a little sheer and very lightweight so it works perfectly. 3. Dress modestly. Obviously many workplaces have a dress code. But when I am wearing leather, I don't want to stand out for anything else. By keeping the rest of the outfit even more modest than normal, it helps to bring that leather into the "workplace appropriate" bounds. I added tights and a longsleeve top to (stay warm) and keep covered. 4. Avoid excessive leather on other pieces. We don't need matchy-matchy leather mm'k? Too much leather can make anyone look overly tough. Not to mention real leather pieces are rarely the exact same shade. Wearing them together will highlight they don't truly match. With a leather skirt, I avoid riding boots, especially with the longer length of this one. Booties or heels are much better options because they are farther away from the leather piece and less leather in general. 5. No sequins and glitter. Sequins or glitter when paired with a leather skirt makes it look like you are ready for a night on the town, not a day at work. While these are fun fabrics to pair with leather for some occasions, keep them at home when you are wearing your skirt to work. Would you ever wear a leather skirt to work? perfect way to wear leather to work. That skirt is such a great find! Love this chic look for work! You made this skirt look very work appropriate. you nailed it!! great tips to take this piece into work wear! This is perfect! I've been really shy about wearing leather to work. Not because our dress code is all that conservative but because I wasn't sure how to wear it without looking overly edgy. These are great tips! These are great tips, especially the one where you should wear a lighter fabric. I don't own a leather skirt, but would like to in the future. You really did nail this look and it is def. work appropriate! I have a leather skirt that I have worn to work. What a steal for a real leather skirt! Thanks for joining my Link Up. That skirt is adorable! I don't usually think to rock something like this to work, but you make it look so professional! I would wear this skirt in a heartbeat! The grid pattern top is the perfect touch, and the necklace really adds an edgy touch! That skirt is a GEM of a find...for $10?! Man I love ThredUp! I love how you styled it here and your tips for making it work for work--I totally agree about contrasting it with lighter-weight materials and keeping it neutral. Love this look! I have a leather panelled skirt that I wear...I love how you tucked in the blouse, I will have to try that next. That is a gorgeous outfit! 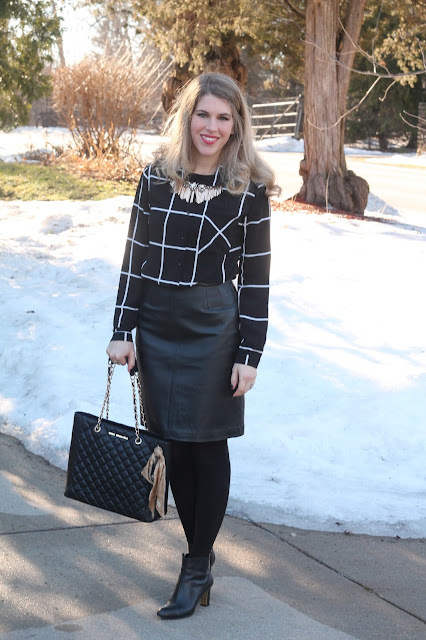 Love the leather skirt and the sweater! Just a great look! You look amazing! Laura, I love this grid top. You've such chic work wear style! Great tips! I would definitely wear leather to work. That skirt is amazing for under $10! Gorgeous work outfit! I love how you styled this! I have always steered away from leather pieces because I did not think they would be work appropriate, but I would totally wear this! These are great tips! This skirt looks so FAB on you! Such a great skirt! Love the ThredUp find. You totally made it office appropriate. I always love pieces that have multiple uses. I love this idea - you totally made this work for buisness attire! I have a similar style skirt and would love to wear it out like this! You make this leather skirt look classy and polished! Great way to spice up an office look. Thanks for stopping by the Weekend Wear linkup! What a score... you can't beat $10. Awesome way to incorporate leather to the work place. A very classy way to style leather skirts! Thanks for linking up to Top of the World Style. Perfect! Leather plus window panel top! A dream outfit! Great work look! I do have a couple of faux leather skirts that I do wear to work. They are all pencil skirt style which makes a lot easier to wear.